So you don’t have a backpack withe Selena Gomez on it. No worries lets solve that with this fun luggage tag. The tag can be placed on your suitcase or a bag for school and besides having the picture you want on your bag it also gives you the opertunity to put you address on it just in case you loose it. And now a bit more about what is on it. The luggage tag is based on the Disney show Wizards of Waverly Place and has that logo on it and below that you see a photo of Selena Gomez as the Alex Russo character from the show. 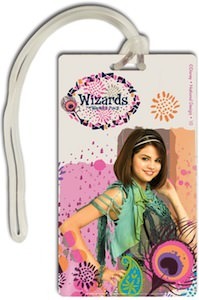 Make sure you don’t loose your bag so dress it up with this Wizards Of Waverly Place Alex Russo Luggage Tag. Kids who love Alex Russo from Wizards of Waverly Place will love this notebook and pen set. The notebook is a spiral one and it is a small notebook (almost as high as the pen) and that makes it great for quick notes at school, work and home. And maybe this could become your next journal. The notebook and pen both have a picture of Alex Russo (Selena Gomez) on it and that makes it realy fun to have for a true fan. Come and check out this Wizards Of Waverly Place Notebook And Pen Set. If you like Wizards of Waverly Place or Selena Gomez then you are in luck. This special handbag shows Selena Gomez as Alex Russo from Wizards of Waverly Place. And this is not just a bag no this is roll bag made out of steel and it has a fun beaded handle to. So store all your handbag stuff in a bag based on Wizards of Waverly Place. Come have a closer and better look at this Wizards Of Waverly Place Roll Bag. This backpack has a lot of pink and purple on it and a lot of different decorations like birds and flowers, but there is more. On the back you see a big picture of Selena Gomez as Alex Russo from Wizard of Waverly Place. If you like Wizards of Waverly Place then this could be the perfect school backpack. This Alex Russo backpack mesures 16 x 12 x 4 inches and has one main pocket, 2 side and 2 front pockets. So as you can see this backpack offers plenty of space for school and fun. 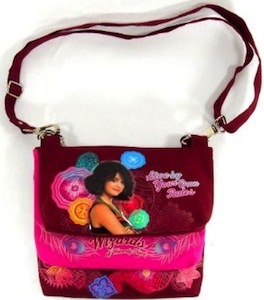 Now is the perfect time to have a closer look at this Wizards Of Waverly Place Alex Russo Backpack. If you are gone have a party then do it right. This set of 8 party invitations are based on Wizards of Waverly place. On the front you see Alex Russo (Selena Gomez) and the words “Wizards Rule!”. And on the inside you will find preprinted lines to make it easy to invite your friends to your wizzard party. 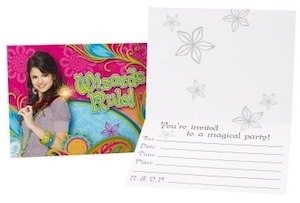 Come check out these fun Wizards Of Waverly Place Party Invitations. There we have Alex Ruso from Wizards of Waverly Place and as many of you know Alex in real live is Selena Gomez. Alex is placed on a notebook sticker that can be used to decorate things like books and journals but it is a sticker so you could put Alex Ruso almost any where. This Wizards of Waverly place sticker comes in packs of 4 so that you have enough to have fun and decorate. Now would be the time to check out these Wizards Of Waverly Place Alex Ruso Stickers. It doesn’t matter if you like Alex Russo or Selena Gomez this poster will make any of you happy. On this poster you see Alex Russo posing like a pegant queen and that works out really wel on this poster. This licenced Wizard of Waverly Place poster is 56 x 86 cm and will make you room look so much nicer. If you are a Selena or Alex fan then come see this Alex Russo Wizard Poster. This a Disney licensed watch based on the TV series the Wizards of Waverly Place. It is a digial watch that has a date and month function and of course will tell time to. There is a nice and colorfull leather band and a clock face with Selena Gomez on it but of course she is playing Alex Russo. If doesn’t matter if you are a fan of the Wizards of Waverly Place or Selena Gomez you just gone love this digital watch. Come and order your own Wizards Of Waverly Place Alex Russo Watch. How about a shoulder bag based on the hit TV series the Wizzards of Weaverly Place? This bag is rate age 3 and up and will be a hit with the girls. On this bag you find a picture of Alex Russo who is played by Selena Gomez. This red themed bag has all kinds of details pointing back to the Wizzards of Weaverly Place TV series. But the main thing is this bag looks great and will be a hit with the kids and it has 3 compartments that can store all kind of cool things kids carry around. This bag is a super gift for a girl who loves the Wizzards of Weaverly Place. Come have a better look at this Wizards Of Weaverly Place Shoulder Bag. How fun would it be if you birthday cake was a Wizards of Weaverly Place cake? I know it would be super fun. And guess what now it is possible and it is pretty simple to arrange. Just get this cake topper that is basicly a picture sheet that you can eat and fits on top of a standard cake. The picture shows Alex Russo with the words “Believe in Magic”. And with this topper you can make kids dreams come true. 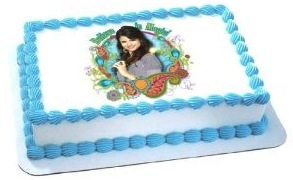 Get ready to make a real Wizards of Weaverly Place cake with this Alex Russo Edible Cake Topper.